When a Turtle Bites How Do You Make Them Release? 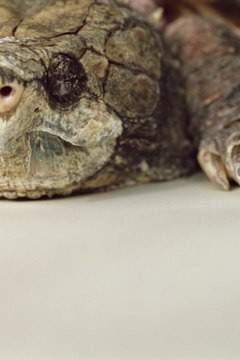 The turtle commonly associated with biting is the snapping turtle. These turtles can be found in swamps, ponds, rivers and lakes. If approached carelessly, a snapping turtle can clamp down with a powerful bite. This bite's power is often exaggerated, as the turtle cannot snap a broom stick in half, let alone a human bone. All turtles can bite, however, and avoiding this bite is all about handling them properly. Remain calm after a turtle bite. This bite is likely a warning snap that accidentally hit you and now the turtle may either release you or hold its grip. Wait for the turtle to release its bite. Do not further aggravate it, as this will cause it to hold longer. Do not kill the turtle; its jaws will then lock and contract even more, making removal more difficult. Step away from the turtle and allow it to retreat. Handle a turtle properly to avoid its bite altogether. If picking one up, do so by the tail or by grabbing it from either side of the shell away from the mouth's reach. Turtles examine object with their nose, so don't be alarmed if one touches you. Approach a turtle from behind and press down on the rear end of to make it retreat into its shell, thus enabling safe handling. Based in Providence, R.I., Myles Ellison has been writing professionally since 2007. He has published work in the "MCLA Beacon" and "Tourism Review International." In 2010, Ellison began profiling small-business owners while working on a street revitalization project. He graduated from the Massachusetts College of Liberal Arts with a B.A. in interdisciplinary studies, concentrating in English, journalism and anthropology. What is the Black Sack That Came Out of My Turtle's Tail?